never mind that i was driving. they moved forward with me into the fog of a warm morning. 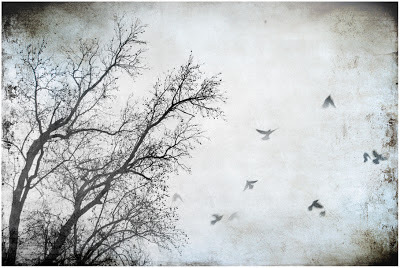 "yesterday i was the laughing eye in a tornado of blackbirds"
and a gorgeous, gorgeous photo. loved the laughing eye of the tornado of blackbirds. and the warm morning fog. we are hovering around 0 for temperatures. NOT warm at all. our blackbirds are no doubt shuttering. holy crow. so stunning and simple.